Due to construction upgrades, the campground has only a limited number of campsites available for rental. Advance reservations are recommended. Please excuse the work while these improvements are made to better serve our guests. 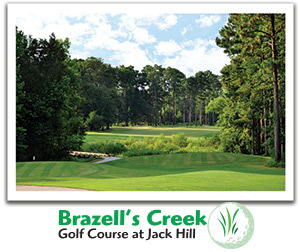 The park’s Brazell’s Creek Golf Course offers a pro shop and junior/senior discounts. The course was expanded to 18 holes a few years ago, making it a challenging—yet fun—test of golf. The Par 71 layout plays to just under 7,000 yards from the tips, boasting five sets of tees. The signature 17th hole is a 207-yard Par 3, which plays over scenic wetlands to a large island green. A 1,500 yard winding bridge connects the original holes with the back nine.